ADLER SAS. 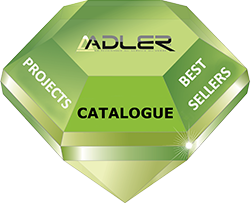 is glad to make your acquaintance..
Adler SAS sells exclusively to professional customers. Private persons are welcome to contact us to get the coordinates of a distributor, in their country. Attention : don't forget to click on "record" at the end of the form. Thanks. Mr, Mrs, Ms ... Mr. Mrs. Ms.
Would you like to receive our promotion by mailing ? For a particular address linked to an order, fill in the boxes at the end of your order..
Could you list usual suppliers ? How did you first get in touch with ADLER SAS ? Please, click on the icon after "record"